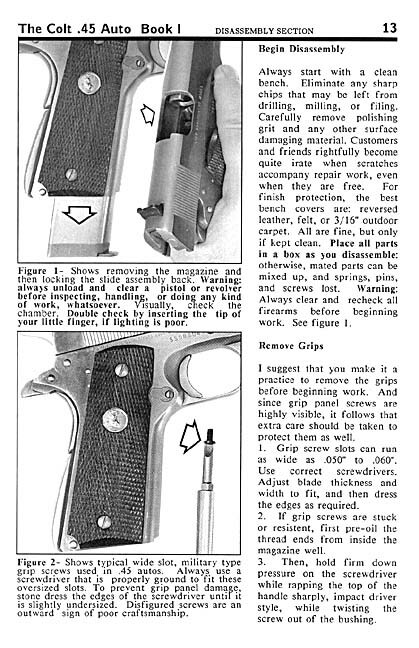 The Colt .45 Automatic: A Shop Manual, Vol 1. With the expanded 10th edition, the original and time tested Colt 45 Auto/M1911 pistol bench manual is now in it's 17th printing and remains the best bench inspection, trouble shooting, repair, hand fitting and basic accurizing manual ever published on the subject. 100's of photos and illustrations. Covers the Colt Government model, including series 80's, and the U.S. Military M1911 and M1911A1 models. Also covers most copies and clones of the M1911 pistol. Necessary tooling is also shown. Click here for a sample page from the book. Readers have commented that the new 10th edition has somewhere between a whole lot more and twice the information and might make earlier editions obsolete. All we can say is we sincerely hope not, because the earlier editions are still full of useful information - The 10th edition just has a whole lot more. Bench edition - 222 pages with plastic laminated soft cover. Be sure to see the new Volume II on the U.S. M1911 & M1911A1 Pistols & commercial M1911 type pistols in this catalog. This 100% brand new manual is the 2nd volume in the Jerry Kuhnhausen .45 Auto series. This incredible book is literally chock full of new and updated practical and technical information. A jam packed reference - typical of Kuhnhausen's M1 & M14 service rifle manual. The new Volume 2 adds a wealth of information to, but does not replace Kuhnhausen's original Volume 1, shown above. Also be sure to see Jerry Kuhnhausen's new M1911/M1911A1 Basic Function & Cycle of Operation Wall Charts listed in this catalog. M1911 Wall Charts are available in two collectable and useful sizes.